How many explosions did you have on your boat the last time you took her out of the slip? None? Well, if you were using an internal combustion engine, you had thousands of explosions within a few feet of you and your passengers. And if those explosions involved a volatile fuel like gasoline, you can be grateful that each of those explosions occurred in a controlled atmosphere like the inside of your engine’s cylinders. 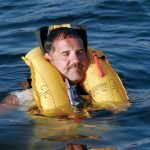 Each year, people on or near boats suffer painful and debilitating burns or even death from fuel vapor ignition in an uncontrolled environment. 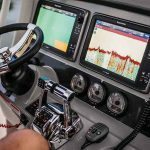 Vapors from leaking fuel lines, corroded fuel tanks or poor ventilation skulk in the low areas of your boat, and create one of the most feared hazards of all. It’s a molecular chain reaction, and it’s sudden, chaotic?and devastating. Have your fuel lines inspected regularly. Look for loose fittings or cracks in the lines, and if you see a problem, fix it. If you use portable fuel tanks, check them for corrosion or pitting. Make sure the vents work properly, and that there is a vapor-tight, leak-proof cap on the tank. 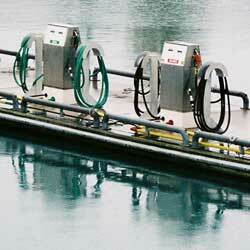 If your tanks are permanently mounted, have them inspected annually. Be certain that they are vented to the outside of the hull, and that fill pipes are outboard so that spills will not end up in closed compartments. If you have a boatload of people, and they’re not all needed for the fueling process, suggest they leave the boat and go browse around the Marina gift shop. The fewer people around the gas pump when you’re fueling the better. If any do insist on staying aboard, remind them not to smoke. Shut off all your engines, electric motors and galley stoves, and close all compartments, ports, windows and hatches. The idea is to keep the vapors out of those areas when you start fueling. Make sure a fire extinguisher is readily available. If you’re refueling portable tanks, take them out of the boat and fill them ashore. If you spill gasoline on the tanks, wipe them off before bringing them back on board. 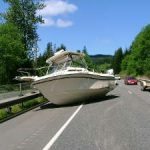 Try not to spill fuel on, in or around the boat. In fact, don’t spill fuel anywhere. Hold the fill nozzle against the metal side of the fuel filler pipe. 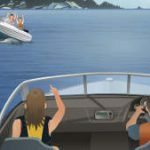 The filler pipe is grounded to the bonding system of the boat, and making contact between the nozzle and the pipe at all times will help prevent sparks from static electricity. Tightly replace the fuel filler caps. Clean up any spills that you weren’t supposed to have in the first place, and properly dispose of the rags you use to clean up the mess. Now you’re ready to open up all the hatches, ports and compartments that you closed up prior to starting the fueling process. Before you turn on your ventilation blower in the bilge, do one final check for fumes by using your Jim-Dandy, Super-Stupendous, Vapor Detection Gadget?your nose. If you smell gasoline vapors, you’re not ready to flip any switches. Find where the fumes are coming from and resolve it. Finally, get your family back on the boat and out of the Marina gift shop while you can still afford to pay for the fuel you just bought. 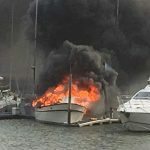 If you follow these procedures, and make sure your fuel tank and lines are in good condition, you stand a good chance of avoiding an explosion hazard on your boat before, during and after the fueling process. Aside from fueling, however, there is one other piece of advice about the use of gasoline I’d like to impart. Don’t clean engine parts with gasoline. I personally inspected a boat with a strong smell of gasoline in the engine compartment, only to find out that the backfire flame arrestor had just taken a bath that morning in gasoline. The owner was quite proud that he was showing me an oil and grease-free arrestor. I strongly suggested that he clean it off again, this time with hot, soapy water, and let it dry thoroughly before he turned over that engine. When it comes to gasoline, it’s always best to keep the explosions inside the engine. So don’t be fuel-hardy — take the few extra minutes to do it right. It could make the difference between a disaster and another fun day on the water. Is This the Newest Lifesaver?